It’s that time of the month again folks! No, Huck isn’t in her “Leave me alone or I kill you mode.” I’m talking about the U.K. Retail Sales report coming out tomorrow! For all of you who love trading the news out there, this could be your chance to bag some nice pips this week. Why is this week’s retail sales report important? In a nutshell, the retail sales report measures the monthly growth of sales on the U.K.’s retail level. Traders pay attention to this data because it is reflective of the economy. If things are nice and dandy, then consumers will go shopping, which should boost the economy. Of course, when sales growth is down, it signals that the economy is drowning. There’s no point in trading the news if it barely moves the market. The whole point of trading a news report is the high volatility that the report could produce, especially if it fails to hit its targets. And this is precisely what makes the U.K. retail sales report so enticing. First, pound pairs are highly affected by the release of U.K. data. It’s like London traders are just waiting for good or bad news to come out and can’t wait to put on a position. Second, the retail sales report, at least so far this year, has a history of failing to hit expectations. For the past SEVEN releases, the report has been off target. This increases the chances of a market reaction, which is good for us traders looking to advantage of any sharp moves. Lastly, with everything that’s happening in the market right now, this week’s release could have a significant impact on the market. If the report were to show that the U.K. is struggling, it would give the BOE more reason to implement more quantitative easing measures, which could lead to some crazy moves. Speaking of wild moves on the charts, let’s take a look at the past two releases to see how the news traders usually react to the report. First let’s look at the release last June 16. At the time markets were only expecting a 0.5% decline in May. Too bad the actual report showed a 1.4% decline, the largest month-on-month drop recorded to date. Add to that a risk-off intraday environment and we see GBP/USD immediately breaking below the 1.6150 Tokyo session support like a bullet through tissue paper. 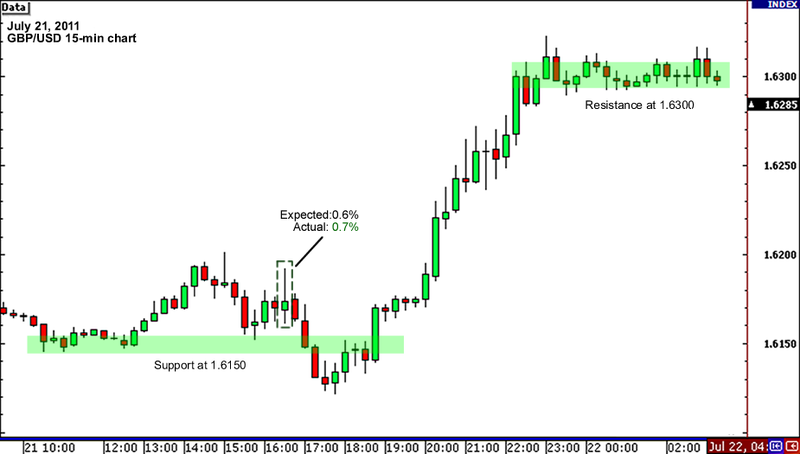 It dropped by almost 60 pips on the first 15-minute candle alone! On the next 15-minute candle the pair retraced half of its 60-pip drop, but it still went down to 1.6080 before it capped the day just below the 1.6150 support-turned-resistance level. Next, on July 21 the U.K. data rebounded and slightly surpassed market expectations. It printed a 0.7% growth against predictions of a 0.5% rise. 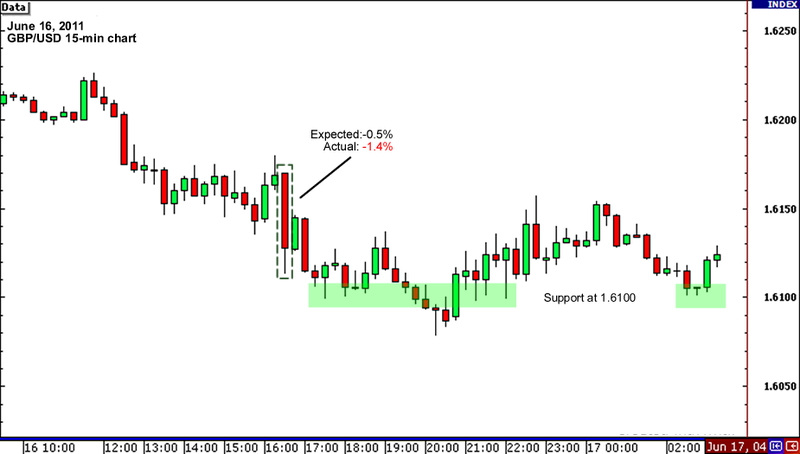 Interestingly, GBP/USD only clocked in a 5-pip gain on the first 15-minute candle and actually FELL by 50 pips on the next four candles on worries that the upside surprise still wouldn’t be enough to give the U.K.’s GDP a boost. Still, the overall risk appetite won out by the end of the day, and Cable closed almost 150 pips higher than its open price. The closing price of the 15-minute candle of the report is directly correlated to the retail sales figure. Major (x.X000) and minor (x.xx50) psychological handles play as support and resistance levels in the first few 15-minute candles. Risk sentiment is a big factor in determining the direction of the pair by the end of the day. For this week’s report, it’s more likely that the retail sales figure will once again miss expectations. If you’re planning on scalping this particular data, then a 50-pip profit target might be easily obtained, especially if the report misses expectations badly. Of course, it’s also a good idea to mark the potential support and resistance levels, and get a feel of risk sentiment before the release of the report. All right, that’s it for my retail sales playbook! Anyone up for trading this report? Give me a shoutout on the boxes below or on my Twitter and Facebook accounts!